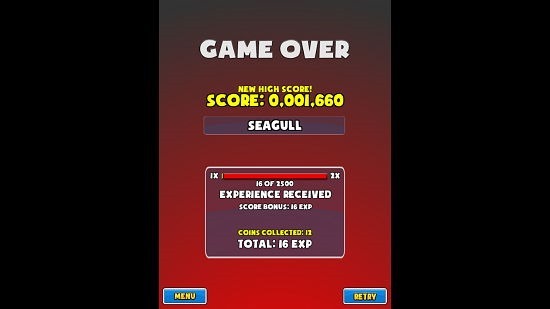 Grand Theft Seagull is a free endless game for Windows 8 and 8.1 which allows you to play as the seagull who is on a quest to collect as many coins as possible in a view to earn the highest possible score. The game when launched will present you with simple options which basically allow you to easily start the game by clicking on the play button in the main screen itself, following which you will be taken to the gameplay screen. The game works with either mouse or touch input, where you can control the flying seagull either via swiping on the screen or by clicking and dragging your mouse on non-touch devices. Grand Theft Seagull is available for free from the Windows App Store. When you run the game on your device, you will be presented with the below screen. In the above screen, you can access the missions list, game shop, game’s high scores, settings etc. but mainly you can start the game by simply tapping on the screen itself. You can also use a left mouse click to perform the same gesture on non touch-screen devices. 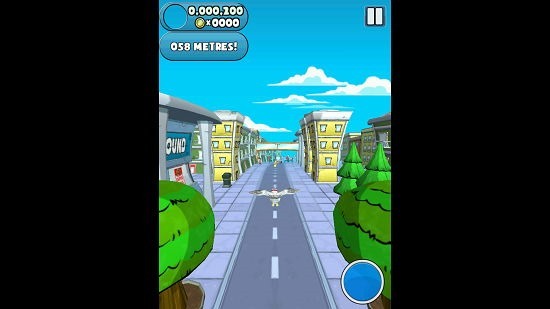 The above screen shows the game’s gameplay in action, where you can see the seagull flying at the center of the screen. You have to collect coins in the game and the farther you go, the higher score you’ll achieve. The game can be paused by clicking on the pause button at the top right corner of the screen. You can also see the distance you’ve flown at the top left screen corner. Once you crash on any obstacle, it’s game over and you’ll be shown the below screen with your score and other stats. This basically sums up the main features of Grand Theft Seagull for Windows 8 and 8.1. 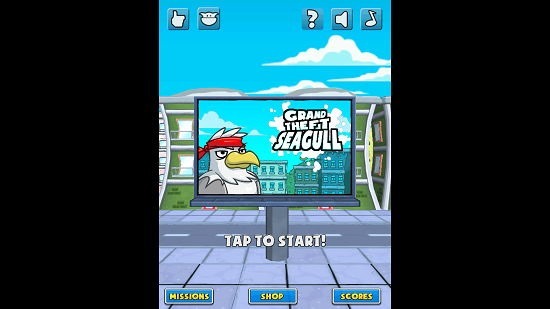 Grand Theft Seagull is a nicely designed and well implemented game which is pretty lightweight. You should definitely check it out by heading over to the link below!